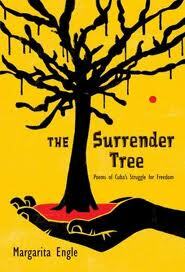 I learned so much about Cuba's history from the immensely accessible The Surrender Tree. I really did not know much at all, but Margarita Engle's free verse novel taught me and inspired me to learn more. Based on the lives of historical figures Rosa La Bayamesa, her husband Jose Francisco Varona, a slavehunter known as Lieutenant Death, and fictional characters, the poems detail Cuba's war-filled years between 1850 - 1899. Over the course of these 50 years, Rosa and Lieutenant Death live parallel lives: she heals escaped slaves and injured soldiers with herbs and flowers, he hunts slaves, collecting their ears and always on the lookout to kill "the little witch", as he thinks of Rosa. Their hide-and-seek takes the reader into reconcentration camps, caves, and swamps, painting a picture of life in Cuba long before the Castro era, a time we don't learn about in the United States. with the juice of boiled yams. Rosa is a heroine worth studying. Engle portrays her as brave, tireless, principled, and wise. She takes her role as a nurse seriously and will treat enemy soldiers with the same care that she treats the Cubans, often causing them to convert to her cause. I hope that Cuban-American girls are learning about this powerful cultural figure because she is the strongest role model I have come across in awhile. Towards the end of the book, a young girl named Silvia is introduced and the interplay between Rosa and Lieutenant Death wanes. I wish that their narration could have continued, although I appreciate that Silvia represents the future, a character who will carry on Rosa's ideals. I can't recommend this book highly enough. Please add it to your libraries and place it in as many hands as you can. You have convinced me! This was seriously such a great review. I feel like I learned a lot in just a few paragraphs, and I honestly cannot wait to read The Surrender Tree now. The passage you quoted gave me chills! I've heard such good things about this book. It's definitely one I'll be adding to my want-to-read list. It really is fantastic! I am now looking for her other novels in verse. Another title I hadn't heard of, thanks! Love the excerpt you shared. I will be adding this to my list. This is one of my favorite novels in verse that I've read so far. Today I am going to the library to pick up another of Margarita Engle's books.